I have always always always been one of those proactive people against 'bullying' or even the nasty kids in school who think they are better than everyone. I have always made it appoint to be nice to everyone (popular or unpopular) throughout my life as well as setting that example for my three children. That being said, October is an important month for our family. October is National Bullying Prevention Month and it's no coincidence that Warner Bros. Home Entertainment aligned the release of He’s a Bully, Charlie Brown for October 6th, 2015 to kick the month off in support of educating and raising awareness of Bullying Prevention. 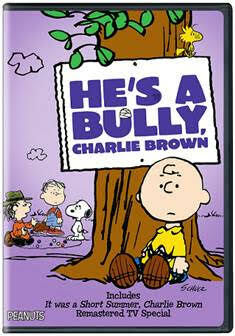 Including not only the powerful message of the special 'He's a Bully, Charlie Brown', there is another special 'It was a Short Summer, Charlie Brown' with a battle of boys vs. girls. The synopsis says "With school out for summer, Charlie Brown and his pals set out for camp. Rerun van Pelt, Lucy’s youngest brother, brings his prized collection of marbles, which once belonged to his grandfather, Felix, an award-winning marbles champ. Rerun is determined to become a marble master just like his grandpa but first, he must find someone who will teach him how to play the game. At camp, Rerun meets Joe Agate, a tough-talking and disrespectful older boy who takes advantage of Rerun’s naiveté and cons him out of all his grandpa Felix’s marbles. A devastated Rerun confides in Charlie Brown, who is so disgusted by Joe’s behavior that he decides to stand up to him, with the help of Snoopy as Joe Cool, of course. Will Charlie Brown summon the courage to face the awful Joe Agate and win back Rerun’s beloved marbles?" The two Peanuts specials have both been remastered in all-new 4K Ultra HD. Let me tell, you this is not one to miss if you've got kids. Not only does it make these difficult situations feel less uncomfortable, it helps teach children how to deal with them and especially that they are not alone. Everyone deals with something similar during their life and it's ok to step up and take action against this type of negativity!